This Costume design by Anthony Holland is part of an extensive collection of designs donated to the Theatre Museum by the artist in 1996. The design was executed for a production of the ice show "The Sleeping Beauty On Ice" at the Empire Pool, Wembley, December 16th, 1972. The show was directed and produced by Gerald Palmer, and choreographed by Reg Park. The music was adapted from Tchaikovsky's ballet "The Sleeping Beauty", and was orchestrated by Arthur Wilkinson, Roy Lowe, and Leslie Kerrigan. The book and lyrics were by Stanley Lloyd. Historical significance: An example of late 20th century costume design for an Ice Show by a designer who extensivley in this specialised field. 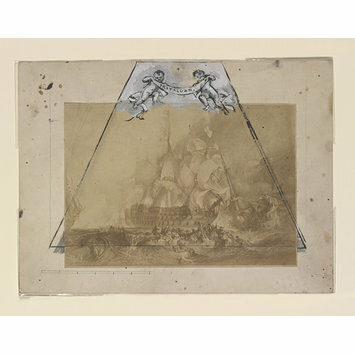 Collotype from a steelplate engraving of Turner's Battle of Trafalgar, mounted on card and worked up as the basis for a design, with a trapezoidal frame in ruled brushed ink line, the base line 217mm long drawn approximately 13mm from the bottom of the picture and cutting off the lower part of the sea, and two lines 172mm long converging to cut off the upper corners of the picture and meet an upper horizontal line 70mm long towards the upper edge of the card. 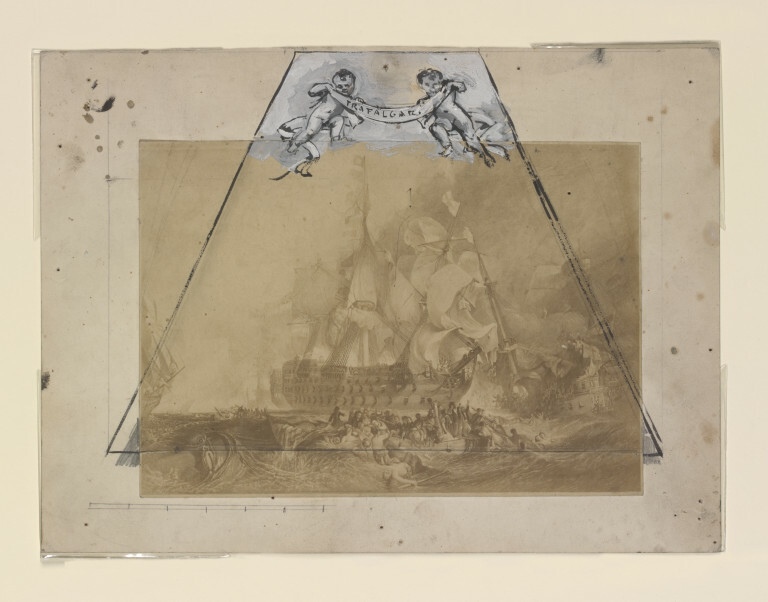 The space in the upper part of the card above the picture filled with an ink and kaolinite sketch of two putti holding a swag and, in ink, the legend 'TRAFALGAR' in Clarkson Stanfield's hand. On the card to the lower left of the collotype is a scale 99mm in length divided into six spaces. Two vertical pencil lines are drawn at 217mm distance from the lower corners of the trapezoid, and are roughly shaded in to fill the gap outside the collotype area.